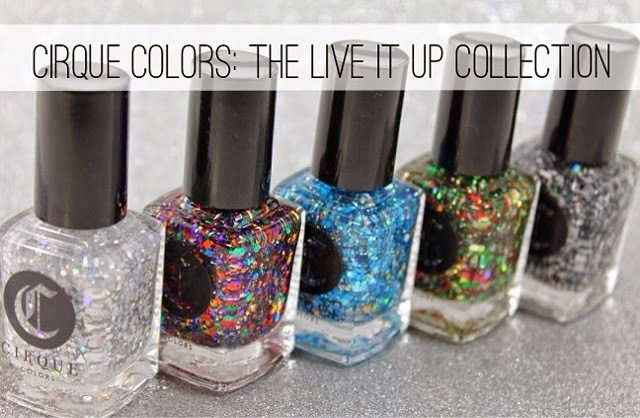 Holo-Day Cheer (LE)- a perfect glitter topper for the upcoming holidays! I've seen many glitter toppers with this color combo, but all are very different. This has red, green, gold and silver glitters. I even loved how there were different shapes of glitters representing the holidays. 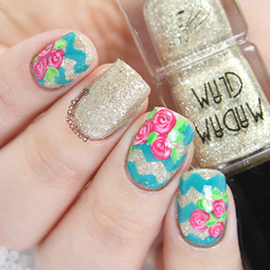 The polish applied smoothly with enough glitters for application. This is one coat over Essie No Place Like Chrome. Of-course I had to do a Christmas theme nail art design. I was completely inspired by the glitters and wanted to create a Christmas tree using one of the stars as topper...so fitting. For the base I used two coats of Deborah Lippmann New York State of Mind and Essie No Place Like Chrome. 8 Crazy Nights (LE)- one of my faves! I just love the various shades of blue and gold holographic glitter color combo. The formula is amazing, not at all thick or gloppy. The right amount of glitters for one coat application. For this, I applied one coat of Cirque Colors Memento Mori and one coat of 8 Crazy Nights. I did the sponge glitter technique for the gradient, sealed with top coat. Couldn't help to create a mosaic type of design over the glitters. Perfectly matched with Essie Good as Gold and Strut your Stuff. I loved how this look, I just couldn't stop looking at them! I can't even explain how amazing the formula is, not at all gloppy or thick like some glitter toppers! There's enough glitters to apply in just one coat. They are now available for purchase on their site here for $13.00 each, well worth especially for a cause. Stay tune for the rest! ~_^ When you do purchase these limited edition toppers, 20% of net proceeds from the sale of Holo-Day Cheer & 8 Crazy Nights will be donated to City Harvest: A food rescue organization dedicated to helping feed the nearly 1.5 million New Yorkers facing hunger.